With today’s start of the Virginia legislative session, a lot of energy and climate bills are pouring in–some good, some not so good, some downright terrible. I’ll have an overview of them coming soon, but meanwhile guest blogger Dawone Robinson gives us a look at one of the best of the bills, the Coastal Protection Act, HB 2205 (Villanueva). A shorter version of his post appeared as an oped in the January 12 edition of the Richmond Times-Dispatch. Many thanks to Dawone for letting me run this. Have you ever put together a list of items you would purchase if you won the lottery—before you remembered that you haven’t even purchased a ticket? Upon reflection, how premature was that list you so perfectly pieced together? In Virginia, we face a similar dilemma when it comes to addressing the mounting crisis of flooding along our coast. We’ve got plenty of laudable lists in the works. Last year, Virginia lawmakers unanimously passed a resolution establishing a joint subcommittee to study recurrent flooding issues and adopt recommendations. Legislators from both parties sent a unified message: flooding is a problem in Hampton Roads and we need to do something about it. In 2008, former Governor Tim Kaine’s Climate Change Commission laid out more than 100 recommendations to mitigate and adapt to climate change and sea level rise. So far the state has failed to adopt a plan to execute them. To his credit, Governor Terry McAuliffe recently launched a similar commission. This panel, the state’s Secure Commonwealth Panel, and the General Assembly’s aforementioned recurrent flooding subcommittee all have the same mandate: convene, discuss, deliberate, and draft a set of recommendations. So what’s the catch? While what needs to be done is relatively easy to identify, the cost is significant—if not staggering. Virginia needs to win the equivalent of a multi-hundred-million-dollar lottery every year to fund the adaptation measures required to protect coastal residents and infrastructure. Hampton Roads is home to the world’s largest naval base, more than $80 billion in economic activity, and 1.7 million residents who routinely feel the effects of sea level rise. Streets need to be raised, levees need to be built, and homes and businesses need to be protected. The U.S. branch of the Dutch engineering firm Fugro estimated that it would cost the city of Norfolk at least $1 billion to fully adapt to rising seas and frequent flooding—which equals Norfolk’s entire annual government operating budget. 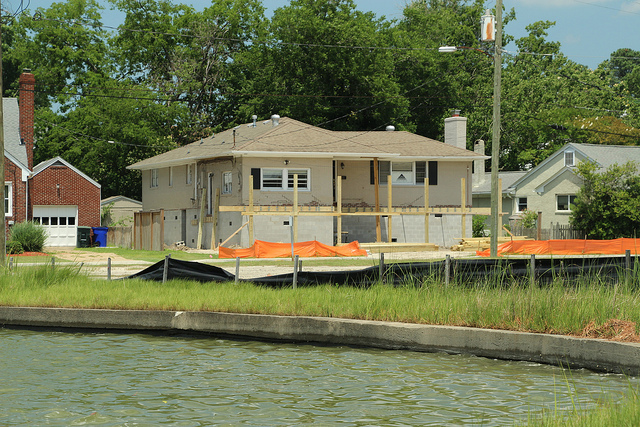 The non-profit group Wetlands Watch reports that the cost to either elevate or purchase the homes of residents in just five Hampton Roads localities that have sustained multiple flood losses of $1,000 or more in the last ten years would exceed $430 million. Relying on federal assistance alone, it could take up to 244 years to assist all homeowners seeking help in these five localities. Meanwhile, the Virginia Institute of Marine Science warns that sea levels could rise by as much as seven feet along Virginia’s coast within this century. We can’t afford to keep creating unfunded wish lists, and we can’t wish the problems away. Virginia needs a dedicated stream of state funding to help coastal families and localities fight climate change. Obviously, there’s no lottery for this. But thankfully there is a common-sense legislative approach being introduced in the Virginia General Assembly by Republican Virginia Beach Delegate Ron Villanueva. His bill, called the Virginia Coastal Protection Act, would help solve our massive coastal flooding problem with a first-ever state funding mechanism that is good for the economy and good for our communities. By joining the state into the highly successful and fully established Regional Greenhouse Gas Initiative, or RGGI, the bill would generate more than $200 million per year in new state funds to invest in coastal adaptation and other climate change solutions. This relief could come when localities in Hampton Roads need it most. It would come without adding any new demands to the state’s tight budget. It would also come through a system proven to rein in energy costs while reducing emissions and raising revenue. RGGI is a cooperative effort of nine East Coast states that caps and reduces greenhouse gas pollution. Since the program’s inception in 2008, RGGI states have reduced their carbon footprint 2.7 times faster than non-RGGI states. In the same time period, electricity prices have dropped by 8 percent in participating states, compared to a 6 percent rise throughout the rest of the nation. Under RGGI, power plants purchase allowances for every ton of carbon they emit. The sale of carbon allowances gets reinvested back to the states. Under Del. Villanueva’s bill, half of Virginia’s projected $200 million in annual auction revenues would fund coastal adaptation efforts, 35 percent would fund energy efficiency and renewable energy projects, and 10 percent would fund workforce development, education, and economic assistance in Southwest Virginia. The Virginia Coastal Protection Act is a win-win-win solution. We can establish a consistent and significant source of revenue to tackle flooding in Hampton Roads and generate funds to invest in other statewide priorities, while putting policies in place to help Virginia meet carbon reduction goals in an efficient and practical manner. Virginia’s lawmakers are on the record in their overwhelming bipartisan support for finding solutions to the state’s growing flooding woes. Delegate Villanueva has put forward the best plan to take us beyond wish lists, and to start funding urgently needed solutions. UPDATE: State Senator Don McEachin (D-Richmond) has agreed to introduce the Coastal Protection Act into the Senate as a companion bill to Delegate Villanueva’s (SB 1428), making this now a bipartisan effort.